Two ongoing randomized trials of SDC programs in Texas and Pennsylvania may soon provide much more information about the effects of mental health SDC than is currently available. Both studies have a rigorous design and are expected to provide estimates of SDC participation effects in relation to mental health symptoms, health-related quality of life, general health status, overall mental health services utilization, mental health treatment adherence, budgetary costs, and other key outcomes. The first of these projects involves participants in Delaware County Self-Directed Care for Community Integration of Individuals with Psychiatric Disabilities. Researchers at Temple University are collaborating with Magellan Health Services, which serves as the program's fiscal intermediary, on a randomized controlled demonstration and evaluation. The evaluation will consist of 75 SDC participants and a 75-person comparison group. A second randomized controlled trial is being conducted at Texas NorthSTAR, a mental health SDC program in Dallas County, Texas. The University of Illinois at Chicago's (UIC's) National Research and Training Center on Psychiatric Disability is the trial's lead evaluator. The primary issue addressed by the evaluation is whether the program improves participants' mental health and enhances their quality of life, while being cost-effective. 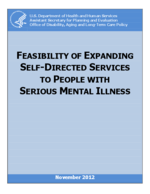 Seventy-five persons with SMI who are receiving mental health care services in Dallas and surrounding counties and who consent to join the study are randomly assigned to either SDC (44 persons) or a "services-as-usual" condition (31 persons). Those in the services as usual condition continue to receive services through the area's NorthSTAR managed care network. Study outcomes include participant satisfaction, service use and costs, clinical indicators, and recovery outcomes such as employment, education, social integration, and quality of life.